Believed to be the first app of its kind being used in museums and galleries, it’s a tablet-based app for visitors aged seven to 15 that encourages children to take the lead and independently explore the gallery. 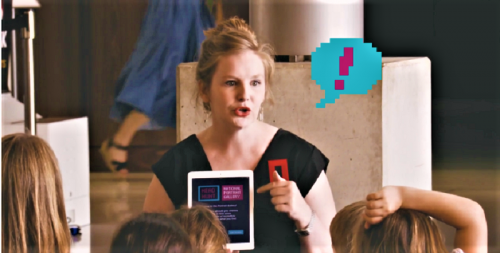 Digital manager at the NPG, Gillian Raymond, said she was looking for a new way to inspire and excite both children and adults whilst being educational and collection focused. “This unique combination of self-directed learning by the participants and the magic of what is actually an extremely complex tech build has resulted in an innovative new way for young audiences and their adults to experience our collection,” she said. Participants are asked to look closely at the portraits that intrigue them and to delve into the artistic elements of the work and the stories of the people featured. At the end of their exploration, a report is generated containing the content (text, image and audio recordings) created by the participants, which can then be shared with their teachers, carers or parents during their visit or as a post-visit activity emailed to the supervising adult. The tech build for “Headhunt!” was created through a partnership with a leading Canberra app development agency Stripy Sock, whose managing director, Jake MacMullin, is a strong supporter of developing technologies to enhance learning and engagement. “Headhunt!” recently won the Museum-wide guide or program category of the GLAMi (Galleries, Libraries, Archives and Museums innovation) Awards, held at the Museums and the Web conference in Vancouver during April and it has also been shortlisted as a finalist in the Museums and Galleries National Awards (MAGNAs), the winners of which will be announced on June 6.